The UN Office on Drugs and Crime released its annual World Drug Report this month, detailing the prevailing trends in global drug cultivation, trafficking, and use. Relying on surveys and other data, the UN estimated that one in 20 adults — a quarter-billion people ages 15 to 64 around the world — used at least one drug in 2014. That number, the UN notes , doesn't appear to have grown relative to the global population over the past four years, but more than 29 million of the people are believed to suffer drug-use disorders. 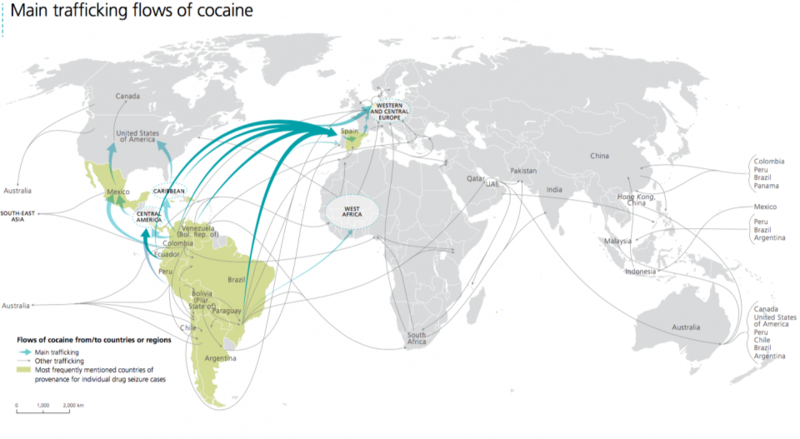 While cocaine cultivation and demand are always in a state of flux, the UN's research into global cocaine production and consumption suggests that the world's cocaine trade is in decline. While global coca-bush cultivation jumped 10% from 2013 to 2014, the area under cultivation in 2014 was the second-smallest amount since the 1980s. Global coca-bush cultivation was also 40% lower than the peak level reached in 2000. The Andean subregion continues to be cocaine's major production area. In 2014, the total area under coca-bush cultivation in Colombia amounted to 52% of the global total, and while Colombia has seen a 58% decline in coca-bush cultivation since 2000, it spiked 44% in 2014, and that increase most likely continued into 2015 (growing 42.5%, according to the White House). In Peru, coca-bush cultivation jumped 44% from 2000 to 2011. While cultivation fell 31% from 2011 to 2014 (back to 2000 levels), it still accounts for 32% of global coca-bush cultivation. Bolivia's coca-bush cultivation has yo-yoed, falling in the 1990s, doubling from 2000 to 2010, and falling 34% from 2010 to 2014. In 2014, it had 15% of the world's coca-bush cultivation — half the total area under cultivation during the 1990-1997 period but 40% more than in 2000. All in all, however, when global cocaine seizures are subtracted from production estimates — and shifting market patterns and user habits are taken into account — the result is "significantly less cocaine on the market," Insight Crime noted . The UN's estimate of the world's opiate users — that is, users of opium, morphine, and/or heroin — has remained stable in recent years and was believed to be about 17 million people in 2014. Because of high opium-production levels in the past, the UN doesn't expect the decline of opium production in 2015 — down 38% from 2014 — to cause major shortages on a global level. That drop in production was driven by a 48% fall in opium production in Afghanistan's southern provinces, though the country still had nearly two-thirds of the world's area under illicit opium cultivation. Regionally, heroin consumption appears to be increasing in North America, causing a spike in heroin-related deaths, while Western and Central Europe have seen stable or declining heroin-use rates since the 1990s, though there are signs that the market in Europe is growing. 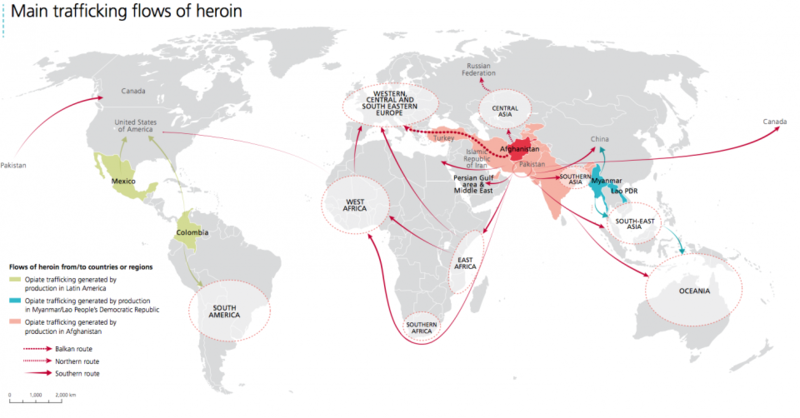 Heroin trafficking, however, seems to have increased around the world, with the "Balkan route" — a conduit for Afghan opium through Iran and Turkey and into Europe via the Balkan states — continuing to be one of the most important routes. Iran accounted for the largest aggregate opiates seizures in 2014, including 17% of global heroin seizures. Heroin trafficking in the Americas has increased in line with production increases in the region over the past 20 years, as well. 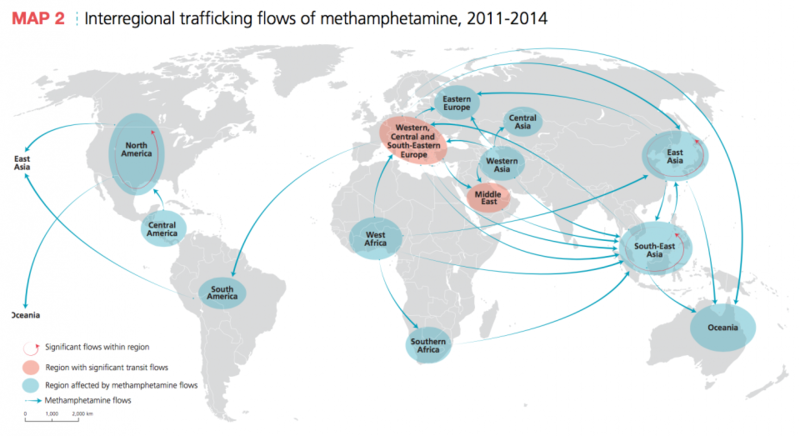 "Since 2009, global amphetamine seizures have fluctuated annually between about 20 and 46 tons," the UN reported , and methamphetamine has been "particularly dominant" among amphetamine-type stimulants seized in East Asia, Southeast Asia, and North America. North America has consistently reported the most seizures of meth, and seizures of the drug in East and Southeast Asia nearly quadrupled from 2009 to 2014, according to the UN. Worldwide, seizures of meth were up 21%, amounting to 108 metric tons. From 1998 to 2014, seizures of amphetamine-type stimulants outstripped seizures of other illicit drugs. While the total seized has ebbed and flowed over that time, in 2014 reported seizures of ATS were nearly eight times what was reported in 1998. The UN also reported that from March 2014 to November 2015, significant amounts of amphetamine tablets labeled "Captagon" were reportedly intercepted in the Middle East. The report noted that while Captagon trade was mainly interregional (2 tons of it were seized in Beirut before being loaded on a Saudi prince's jet in October 2015), large amounts had reportedly been moved from Lebanon and Syria to places outside the region. Those seizures would seem to back reports that Captagon production had spiked in Syria since that country's descent into civil war in 2011, with unconfirmed reports of various factions in the country using sales of the drug to fund their operations.